Women’s Crew Neck Top Just $6! Down From $20! At Walmart, you can score this Women’s Crew Neck Top for just $6 down from $20 PLUS FREE shipping for orders $35 or more! Celebrate the holiday season and chill in this Women’s Fleece Top from EV1. It’s lined with pillowy-soft fleece to keep you comfortable when you’re enjoying a meal with friends or lounging around the house. 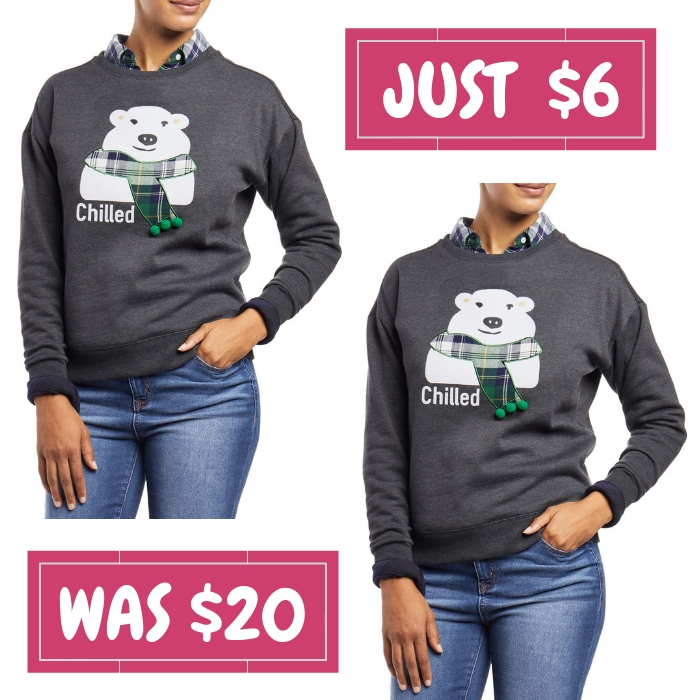 The polar bear graphic on the front is accented with a cute array of 3D pom-poms, while the crew neckline, straight hem and sleeve cuffs are all ribbed for a cozy and hassle-free fit. This fleece pullover is available in a gorgeous charcoal colorway to complement your cool-weather wardrobe. Pair it with your favorite leggings and some sneakers for an easy and casual outfit, or throw it on over some pajama pants for a lazy Sunday at home.